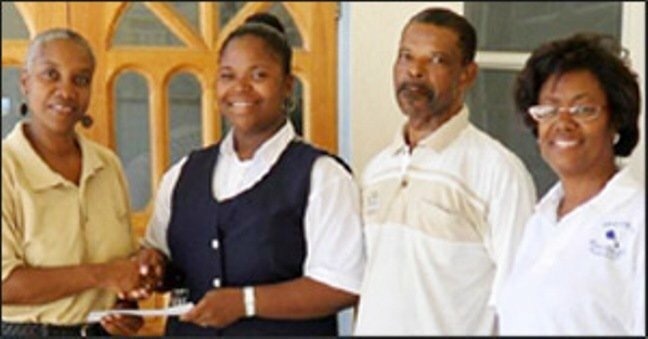 Sixteen-year-old Patrice Harris of Cardin Avenue in Basseterre is the winner of the 2009 scholarship awarded by the Foundation for Academic and Character Excellence (FACE). Ms. Harris, whose goal is to become a lawyer, outshone three other applicants for the scholarship with 11 Caribbean Examinations Council (CXC) passes, 9 of which were at the Grade I level. Her essay, in which she spelled out the reasons why the scholarship would benefit her, as well as the sterling letters of recommendation that accompanied her application, gave additional clear evidence as to why she should be the winning candidate. Ms. Harris is now attending the Clarence Fitzroy Bryant College (CFBC). The scholarship, which is worth EC$2000, was set up in 2005 and is funded and managed by a group of former Basseterre High Students, most of whom graduated from Sixth Form in 1979 and who currently live in North America, the United Kingdom, and Saint Kitts and Nevis. The aim of the FACE scholarship is to assist high-achieving students who excel academically but whose financial constraints may prevent them from pursuing tertiary-level studies. The Foundation works directly with Basseterre High to identify potential candidates for the scholarship and continues its interaction with the scholarship winners well after their stint at the Clarence Fitzroy Bryant College ends.